The Zanes Law Arizona burn injury lawyers want to discuss how to prevent holiday related burn injuries. Christmas and New Years are right around the corner. These are times of celebration full of holiday parties and dinners with great friends and family. Imagine the crisp night air, maybe a little snow on the ground when you walk outside! “Burrrr” you say! Such a wonderful time of the year! 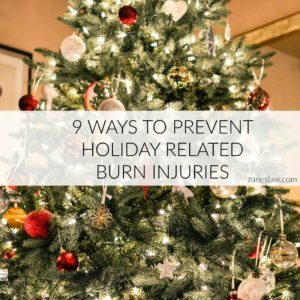 So why are we focused on how to prevent holiday related burn injuries? It seems odd that fire safety needs to be a concern during the coldest months of the year, but in all our years of handing burn injury cases in Phoenix and Tucson we have learned that the holiday season can be one of the most hazardous when it comes to burn injuries. Around the holidays we see a number of burn injuries that can easily be prevented, which is my goal as a personal injury lawyer. These burns are caused by getting too close to a heat source or flame. For example, standing too close to a fire in the fire pit or getting burned by a candle can lead to devastating burns. So be careful when making those smores! Also standing too close to a space heater or temporary heating device can be dangerous. Coffee or hot chocolate that is too hot can also cause a serious burn! While the warm drink may be comforting and make it feel like Christmas, a scalding drink that lead to life changing injuries because superheated liquids can cause second and third-degree burns. We all love decorating our homes with Christmas trees and lights, but make sure that everything is kept up. Christmas lights are expensive, which is why we use the same ones year after year. Over time, the wiring can become exposed or bad creating both an electrocution hazard and a fire hazard. So double-check those light strands before putting them up! Cooking equipment is the leading cause of reported home fires and home fire injuries in the United States. Most of these fires occur when foods that are cooking are left unattended in the kitchen. Be safe in the kitchen. The entire team at Zanes Law Offices was very professional, accurate, precise and had my best interest at heart. They always kept me informed and offered the best advice for my case. Zanes Law group were always available when I needed them. Michelle was very good with communicating with me ensuring I understood what was going step by step with my case. I was in control at all times, and I made the final decision while the attorneys listened, and advised. Never did I feel intimated or left alone. Hats of to Michelle Picornell and the entire Zanes Law Group! I rate them a 10! If you have suffered an injury because of the negligence of another person please contact Zanes Law immediately to get some help. Click below to receive a link to a free Fire safety coloring and activities booklet for children ages 3-5.